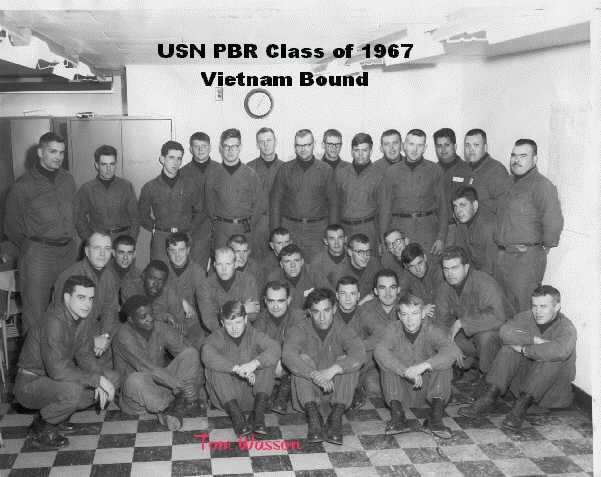 The PBR's went to Vietnam for the first time in early 1966-to Cat Lo & later to My Tho. 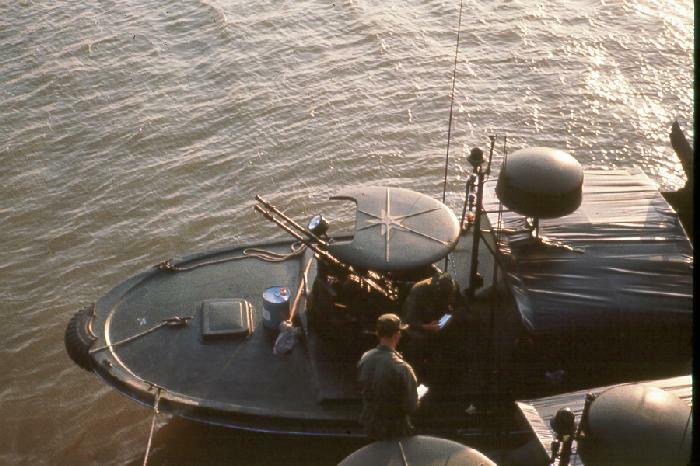 I had command of River Section 543 in Cat Lo, on an LST (which I can't remember) anchored at the mouth of the Soi Rap river,& in Nha Be. This was in 1966-1967. I assumed command around August from Lt. "Hank" Mauz( I had ben originally assigned in July as his Operations Officer ). He went away to command a Minesweeper & later became CinCLant!! He retired as a full Admiral sometime around 1985! 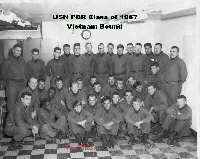 I came back from Vietnam in July 1967 & stayed in the USN until 1983. When I retired as a Captain, having served 34 years in all ranks from SR to Captain. I was commissioned Ensign in 1960 (from CPO) in the NESEP program. My name is Auldreg Dismuke but everyone calls me sonny. I served with 531 from April 69 to April 70. 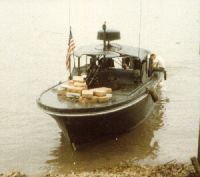 I was in assigned to PBR 98 and served on this boat for 2 months as a third class gunners mate. I was made boat caption of PBR 105 and given a field promotion to 2nd class. PBR 105 was damaged in a fire fight in giant slingshot. I was then assigned PBR 98. 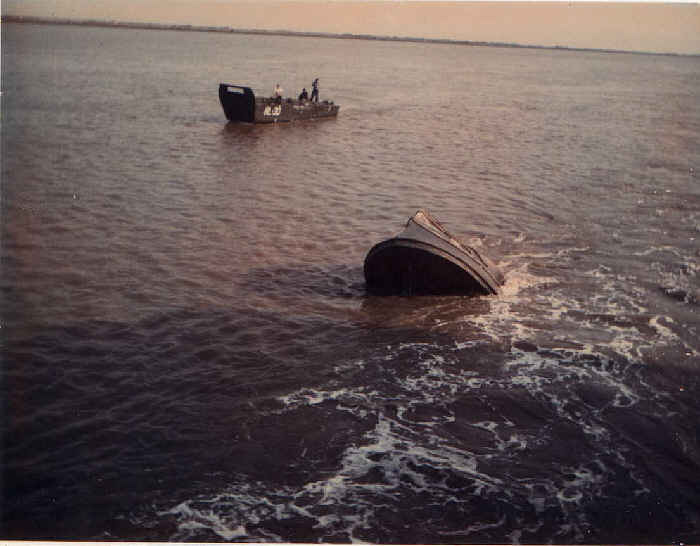 This boat was damaged while on patrol. We had set an ambush with Long Range Patrol Army personnel. They went out about 300 yards and set up an ambush. The NVA got between us and waited for the heavies to come by. They shot through us not knowing we were there and we did not know they were there. The troop transports did not know we were there. 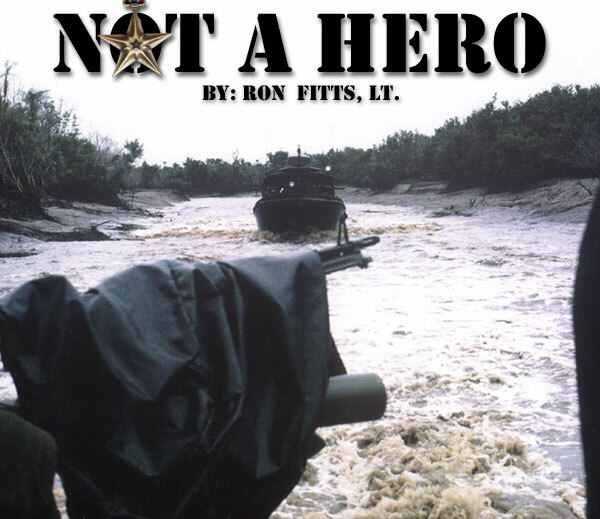 The NVA attacked the transports and the transports fired back through us and we fired at the NVA killing one officer and the army fired at the NVA. 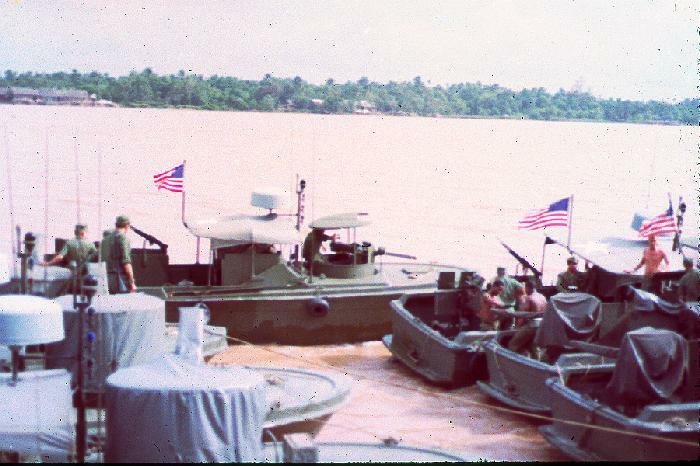 It was a four way fire fight with PBR 98 and the NVA in the middle. 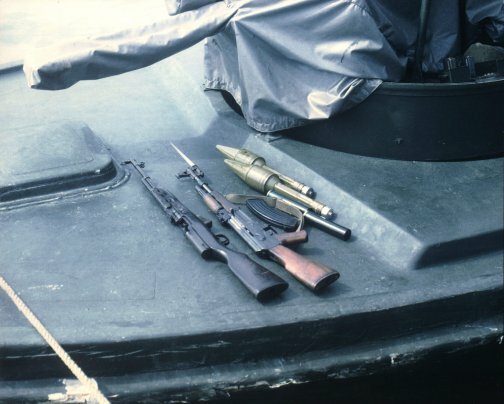 I was wounded in the arm and the boat received 109 bullet holds. We were able to make it back the floating base. We took PBR 98 back to NhaBe and I was assign PBR 32. I used PBR 32 until we lost a motor. I was assigned PBR 109. 109 was a very good boat. It was by far the fastest of any of our division boats. 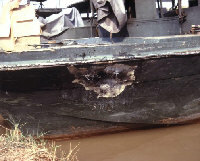 The boat repair at Nha Be fiber glassed chimes on the bottom sides. This caused the boat to get on step faster and run on less water. We were assigned a new patrol area above Saigon. This was even a hotter area. 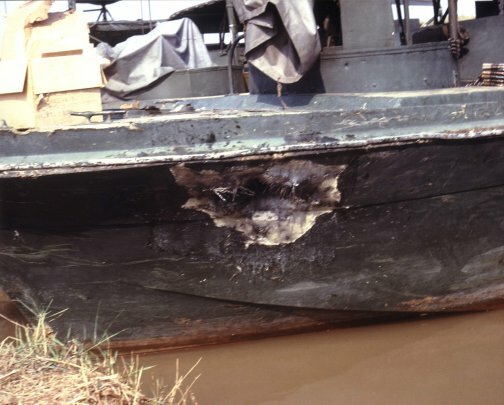 PBR 109 was shot up bad in a fire fight. I needed to get one more patrol before our crews could get some rest at NhaBe. I asked Williams if I could use PBR 57 one night to get our patrols in. I promised him I would set a safe ambush so as not to damage his boat. Every thing went well and we were heading back to base when I looked up to see a B40 rocket coming at us. The boat took a hit below the water line and took out the starboard engine. The boat was riddled with hits but no one was hit. I jumped in the water and plugged the hole with a life jacket. We were close to the base so the rest of the boats scrambled to help us. PBR 109 didn't have a port engine so we tied 109 and 57 together and used the outboard engines to get us back to NhaBe. We stayed at Nha Be for 3 days and was reassigned PBR 105. I kept 105 until I left Nam. I had 289 patrols and 18 fire fights. A Mark 1 PBR Top View. 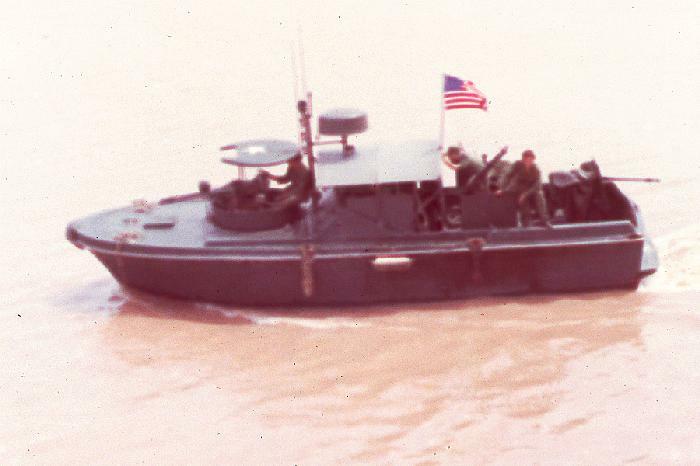 A Mark 1 PBR side view. 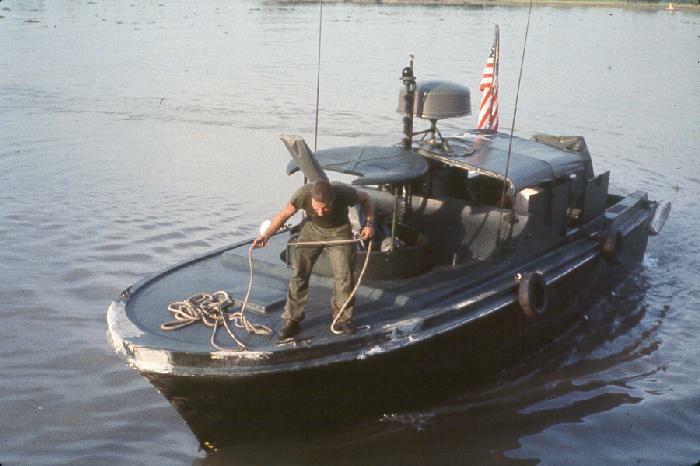 A Mark 1 PBRs dockside - at Vinh Long?. 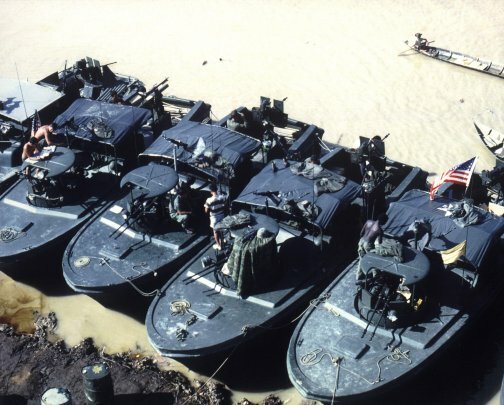 A PBR delivers supplys to an advisor post near Minh Duc. 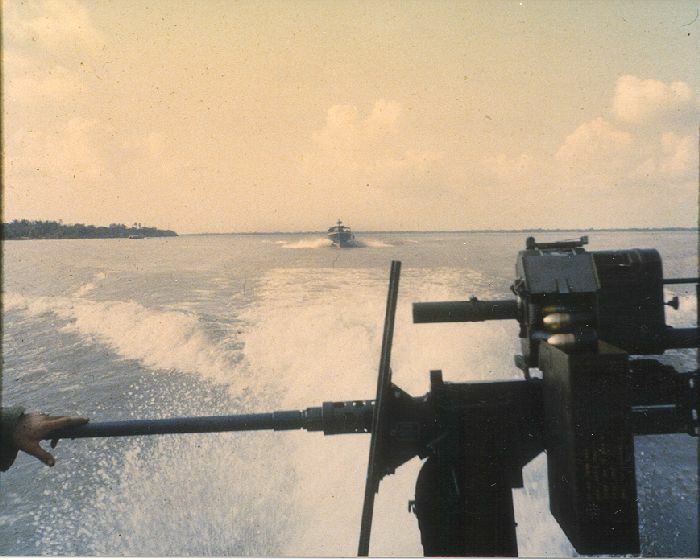 Aft view on the Co Chein river near Vinh Long. 50 cal has a grenade launcher on top. Mark II PBRs docked on canal bank. The Mark I PBR had no floatation foam inside. 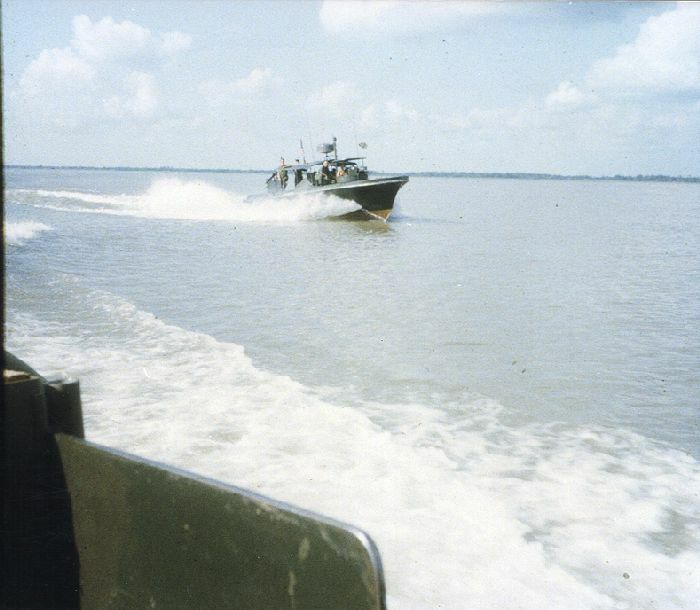 Mark I PBRs on patrol in a narrow shallow canal. has been saved on the Guestbook Page. by Location, type of Unit, Vessel, Vessel type and other Categories. and to ask for info. Many Veterans read these Messages. to read more stories, and remember more. Especially to Widows and Orphans. and revise the pages like a book edition semiannually. I intend to post every relevant donated photo or story eventually. Be Patient. This Web Book has become so large I do not view some Pages for months at a time. This Patch is Courtesy of Jack ? cataloged by number, location, Unit or Vessel.